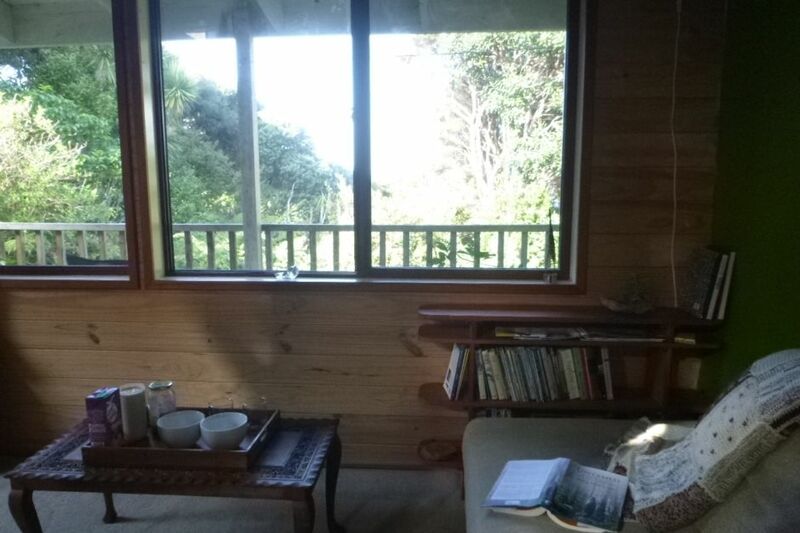 This home is centrally located within Tryphena, on Great Barrier Island. A two-minute stroll down the road gets you to the Stonewall Store, the weekly Village Market, the Wild Rose Cafe, yoga classes, and the famous Irish Currach Pub. Within a 5 minute walk you can get to a boat ramp and two safe swimming beaches - Gooseberry Flats and Pah Beach. This home is open plan, split level with large windows in the lounge area and surrounding decks facing a view of bush and sea. Enjoy this space by picking out one of the 100s of books which are dotted on shelving throughout the house all the while listening to the kaka, tui and kereru in the towering powhutuakawa tree. There is one master bedroom with access to the deck, a second room with two singles and another bed in a loft, but which is not a complete room in itself. The kitchen is equipped with a microwave and electric oven, as well as a large fridge/freezer, bread maker plus a gas stove and oven. We are on solar so not all appliances can be used when the sun hasn't been out. Also available for your use is ..
Wifi, a large-screen smart TV with freeview, DVD player, a stereo and CD player. Large screen with Netflix and unlimited broadband. Bach was in great location, central to everything we needed store, cafe, pub, beautiful beaches, bush walks. Property in very handy location. Property in very handy location. Beach and shops are just down the road. Had a great trip!